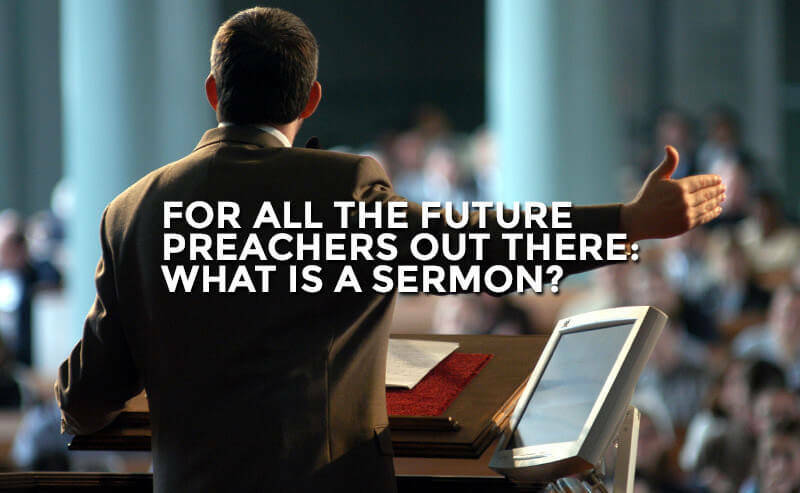 Blog For All The Future Preachers Out There: What Is A Sermon? For All The Future Preachers Out There: What Is A Sermon? When Dr. John Piper recently retired from his pastorate at Bethlehem Baptist Church he said that one of the primary marks of his ministry was the pulpit. He said that in his church there is a large and heavy, wooden pulpit that sits at the front and the center of the room. He made sure to be clear with his listeners that this pulpit has nothing to do with him, and everything to do with the Word of God being preached. It is the preaching of the Word of God that constitutes a church truly being a church. There are unending problems with the church and the people who make it up, but as long as the Scripture is being preached it will always be a church of God. A group of religious radicals who love God and diligently care for the poor and oppressed are admirable, but alone do not constitute a church. A group of psalmist, poets, and spiritual artists alone do not constitute a church. Even a community that lives together day in and day out and loves the Lord with all their heart does not constitute a church. A true church is the place where the Word of God is being preached. It is not enough to simply read the Scriptures on our own. We are all in desperate need of the preaching of the Word. The Puritans held a high and biblical view of the pulpit. They believed that it was the place from where both light and heat exuded to all those who listened. The light represented the illuminating effects of the Scripture being opened and expounded upon, and the heat represented the passions and the pathos of the preacher. They believed that both were necessary for people to truly understand the message of the Gospel. This is not simply because the preacher knows something that we don’t, but because the Spirit does something supernatural in the preaching of His Word. Regardless of the failures of the preacher, God in His sovereignty and grace chooses to drench those very fallible words being spoken with the infallible power of His Spirit. Every time a sermon is given a miracle is taking place, if only we have the ears to truly hear it. It is important for us to come to understand the person and ministry of Jesus within three distinct roles: Christ the King, Christ the Priest, and Christ the Prophet. We often devalue the prophetic role of Jesus. Jesus is the healer and the savior and our deliverer, but we neglect to acknowledge Him as Christ the Prophet. Preaching is the prophetic role of Jesus. We also are all called at varying degrees to live out of all three of these roles. We are a king to people when we lead them with wisdom and grace. We are a priest to people when we love and serve them in their time of need. And we are a prophet to people when we preach to their souls. There is a famous quote that I have grown to hate with all my heart. It has often been attributed to Saint Francis of Assisi. Whether or not this is actually who it originated from is hardly my point. It says this, “Go into all the world and preach the gospel, and if necessary, use words.” Regardless of whether you like this quote it is undoubtedly wrong. It has influenced believers all over the world that God approves of their cowardly silence as long as they are doing something nice for others. However, the verdict is out. It is absolutely necessary to use words in the preaching of the Gospel. The Apostle Paul said in Romans 10:14 “How then will they call on Him in whom they have not believed? How will they believe in Him whom they have not heard? And how will they hear without a preacher?” We must all be faithful to the preaching of the Word of God. Without it our world will remain lost and completely dead in their sins. It is one of our highest callings as followers of Christ. When we preach we are truly being Christlike, because we are choosing to honor and recognize Jesus as not only Christ the Prophet, but as Christ the Preacher. Do not be deceived friends. Preaching is a risky business. It will cost you everything you have. If you succeed and do it well you will be loved by few, but hated by many. Many of us are under a false illusion that people actually want the truth, but we forget that truth is not a concept nor is it an idea. Truth is a person and His name is Jesus. Many will be offended by our preaching, but many will be struck to the heart. So friends, I ask you this: Are we willing to be despised by the clay for the sake of the ice?